Last week ICTFOOTPRINT.eu attended and presented its poster at the World Sustainable Energy Days (WSED17) in Wels, Austria – one of Europe’s largest conferences on energy efficiency and renewable energy. Around 700 exponents from a variety of countries and domains attended a vibrant and varied discussion concerning different aspects of energy efficiency and sustainability. ICTFOOTPRINT.eu contributed to the event with a poster presentation, showcasing the Self-Assessment Tool for ICT Services (SAT-S), a useful, free, quick and easy-to-use tool to calculate the carbon footprint of ICT services. The WSED17 audience learned how SAT-S can help them make informed decisions on how to make their ICT services sustainable and energy efficient. 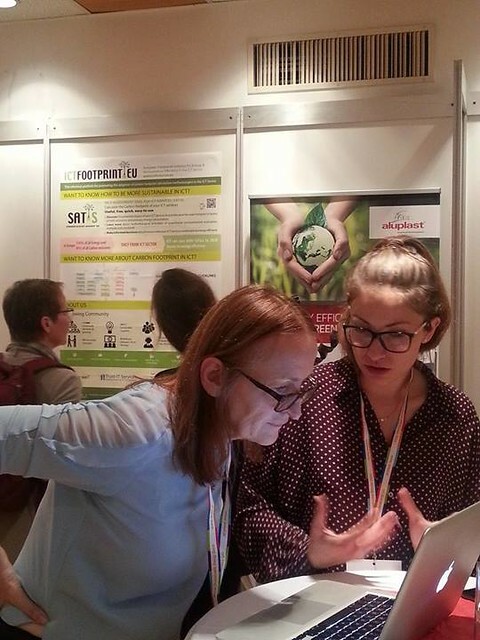 ICTFOOTPRINT.eu, represented by Trust-IT Services (project coordinator), achieved a really positive impact from the participation to WSED17: many exponents coming from different sectors showed their interest in finding out more on how to reduce carbon footprint in ICT or discussed about potential synergies and opportunities for exploiting our insights and using them for raising awareness on this topic. Eight different conferences took place during the three-days event and featured the presentation of renowned exponents of EU Commission like Giulio Volpi, administrator at the Directorate General for Energy of the European Commission, with a presentation on Bioenergy in the EU "Clean Energy Package”. Paul Hodson, head of the European Commission’s energy efficiency unit, focused on the new EU energy policies, which aim to provide clean energy to all European citizens. A really impressive overview was made by Tyler Bryant from International Energy Agency, the international intergovernmental organisation founded by OECD (Organisation for Economic co-operation and development) in 1974. The presentation highlighted the energy efficiency market trends and the role of our policies and businesses, analysing a variety of aspects in the energy market. It was clear that joint activities and efforts are vital for fostering the adoption of a sustainable new approach, both in ICT and in other aspects of energy efficiency like in building and biomass. This is why ICTFOOTPRINT.eu was particularly glad to attend the conference and to meet many relevant exponents of the sector – expecting to create solid networks capable to support the environmental sustainability of Europe.